AVERT C-2 platform integrates hundreds of disparate sensors and information sources to keep frst responders aware of their immediate environment in real-time. 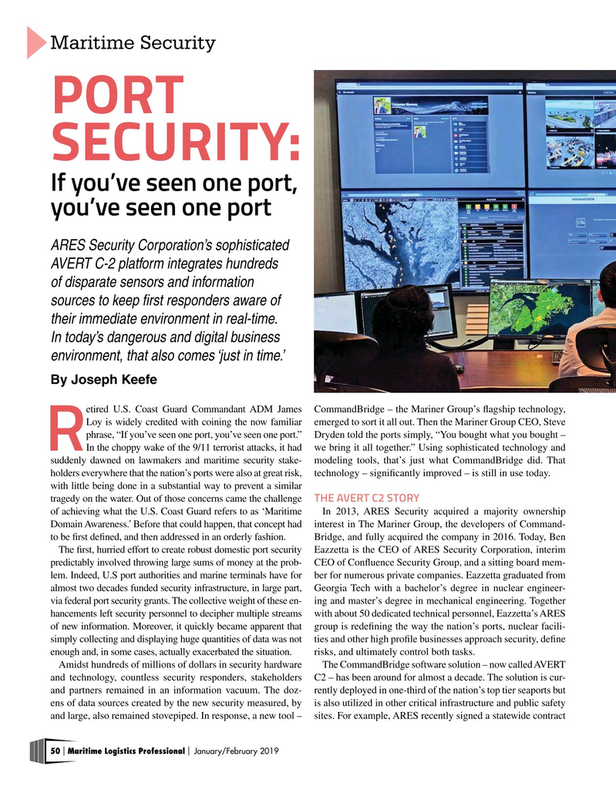 RIn the choppy wake of the 9/11 terrorist attacks, it had we bring it all together.” Using sophisticated technology and suddenly dawned on lawmakers and maritime security stake- modeling tools, that’s just what CommandBridge did. That holders everywhere that the nation’s ports were also at great risk, technology – signifcantly improved – is still in use today. The frst, hurried effort to create robust domestic port security Eazzetta is the CEO of ARES Security Corporation, interim predictably involved throwing large sums of money at the prob- CEO of Confuence Security Group, and a sitting board mem- lem. Indeed, U.S port authorities and marine terminals have for ber for numerous private companies. Eazzetta graduated from almost two decades funded security infrastructure, in large part, Georgia Tech with a bachelor’s degree in nuclear engineer- via federal port security grants. The collective weight of these en- ing and master’s degree in mechanical engineering. Together hancements left security personnel to decipher multiple streams with about 50 dedicated technical personnel, Eazzetta’s ARES of new information. Moreover, it quickly became apparent that group is redefning the way the nation’s ports, nuclear facili- simply collecting and displaying huge quantities of data was not ties and other high profle businesses approach security, defne enough and, in some cases, actually exacerbated the situation. risks, and ultimately control both tasks.